Eagles quarterbacks Carson Wentz (left) and Nick Foles warm up before the team’s game against the Los Angeles Rams on Dec. 10, 2017, in Los Angeles. The first two starts were uninspiring. Four touchdowns, but two interceptions; sacked eight times; an 89.3 passer rating. The offense scored 44 points, true, but it sputtered. There were problems along the offensive line, there was no real chemistry between the quarterback and his receivers, and an unimposing team from the AFC West called into question the quality of the Eagles' attack. Carson Wentz & Co. didn't look great after his first two starts of 2017. Why, then, should Nick Foles & Co. look much better? Wentz eventually found his legs and made an MVP run; something Foles will probably never do. Granted, Wentz was so good so often that he gave hope to Eagles fans steeped in 57 years of hopelessness. A measure of despair in this moment is understandable. But to expect Foles to immediately be as effective as Wentz is simply unreasonable. Their numbers after two full starts are strikingly similar. Foles had five TDs and one pick, an 87.6 passer rating, and produced 47 points. He looked bad in his meaningless quarter of play against the Cowboys in the finale, but Wentz wasn't much better in his ninth quarter of the season, either, against the Giants: two three-and-outs, two more sacks. There was no indication that Wentz's offense would rise to the top of the league. Number One receiver Alshon Jeffery, left tackle Jason Peters, and running back Darren Sproles were limited in the preseason. It showed. Why shouldn't Foles be having similar problems? While Wentz was leading the team to the top of the NFC and setting them up for this weekend's bye, Foles spent five months throwing to Sheldon Gibson and Marcus Johnson at the bottom of the roster. Then, when Wentz tore his ACL in LA, a tornado descended. "It has been a whirlwind the last couple of weeks," Foles said Wednesday, after practice at the NovaCare Complex. Foles hibernated at home from New Year's Eve until Wednesday morning. He let Tori, his wife, sleep in twice. He spent a couple of rare, delightful mornings with his 6-month-old. "I just sat there with Lily, and basically just read to her while I had my coffee," Foles said. "Those little things reenergize you." He sounded energized. Focused. Charged with a sense of purpose. He was still wearing his high, white cleats. He looked like he wanted to go practice some more. Eagles quarterback Nick Foles is hit while throwing the ball by Dallas’ DeMarcus Lawrence (90) and pressured by Anthony Hitchens (59) in the first quarter of Sunday’s 6-0 loss to the Cowboys. "We got better today. Hundred percent, got better," Foles said. "Especially for me, being in the situation I'm in. Getting more reps with the guys. Stepping in the huddle. Repping things over and over again." Eagles coach Doug Pederson ran especially light practices in the weeks leading up to Games 15 and 16. That rejuvenated the defense but stalled the offense, as it tried to integrate a new quarterback. At the insistence of the players, the Birds on Wednesday had a hard-hitting, high-speed, fully padded practice, which is rare for teams still playing in January. They'll hit a couple of more times, too, before they host the divisional playoff Jan. 13. Can a few tough practices really make a difference? "Today was a lot better than on Sunday," Foles said. "You just gradually progress and keep improving. I've had [bad] games like that, and I've come back and played at a higher level." As long as the whirlwind diminishes, higher levels are possible. "The key is to get in the zone. Get into the rhythm of the offense. That's when everything slows down," Foles said. "It all starts with preparation." The city is prepared for disaster. That's weird. When the Eagles signed Foles in March, wasn't he supposed to be the best backup in the NFL? Wasn't he, as a former young star QB in Philly, supposed to be the perfect mentor for Wentz? Pederson was the offensive coordinator in Kansas City in 2015, and Foles was the backup quarterback there in 2016, and that made Foles a perfect fit, right? He certainly cost enough. Foles got a two-year, $11 million deal, and $7 million this year. But to add Foles, the Eagles had to cut 2016 backup Chase Daniel, who, after all the math and machinations, cost the Birds $6.1 million against the cap. So, that's at least $13.1 million. A bargain, they said. What, exactly, changed? Five quarters of poor football? Why? What did you expect? Foles went to the Pro Bowl after 2013, when he threw 27 touchdown passes with just two interceptions in 10 starts after Michael Vick got hurt, but 2013 was always a mirage. His five offensive linemen made every start, and two went to the Pro Bowl. So did running back LeSean McCoy and receiver DeSean Jackson. The next season better explained the Foles phenomenon. He threw 13 TDs and 10 picks before he broke his collarbone in Game Eight. The Birds then traded him to the Rams in 2015, where he was 2-7 in his last nine starts, with two touchdowns, nine interceptions, and a 53.1 passer rating. He has been a backup since. He always will be, unless he turns into Rich Gannon. Hey, it could happen. It could begin as soon as Jan. 13. 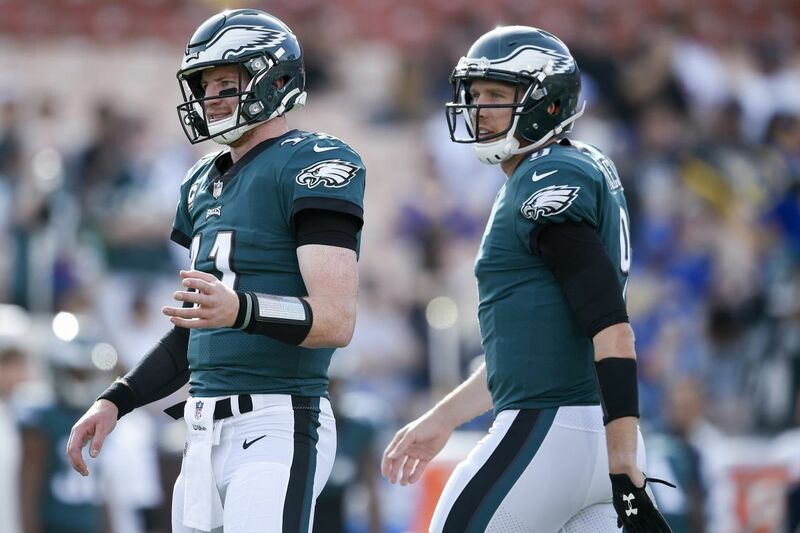 After Wentz tore his ACL in LA, Foles entered and won that game; won the next game; won the next game, but did so ugly; then was just as ugly for 15 worthless minutes against the Cowboys. That wasn't the best you've ever seen from Foles, so why think it's the best you will see from Foles? To assume he can't play well enough to win is to assume that general manager Howie Roseman and Pederson, who should be executive and coach of the year, are wrong about Foles. They've been right about everything else. They signed Nick Foles for this exact moment. Maybe they're right about him, too. NFL draft preview podcast: The Eagles’ top prospects; will we see any surprises?